Shoppers in the well-established north coastal development corridor of Durban will soon be spoilt for choice. Set to open in September 2017, the 85,000m² Cornubia Shopping Mall is rising from the old cane fields alongside the M41 at Flanders Road. With one eye on the staff in the Cornubia Town Centre and another on the neighbouring residential areas – Mount Edgecombe to the south west, Phoenix to the west and the Cornubia residential precinct to the north – the Cornubia Shopping Mall first phase of 65,999m2 will provide a retail solution for all needs. Although mixed use, the major portion of the Cornubia development will be residential, with 25,000 housing units ultimately being developed. Cornubia is a national pilot project of the Breaking New Ground policy launched in 2008. Roughly half the size of the Gateway Theatre of Shopping, Investec Property is developing distinctive and differentiated product in terms of tenant mix and design. Boasting two supermarkets and 1,630 on-grade parking bays, 1,608 basement bays Cornubia offers maximum convenience. The mall is strategically located near the Umhlanga/Mount Edgecombe interchange and is adjacent to the Cornubia Town Centre where a few stands are still up for grabs. “This forms part of a holistic spatial development,” explains Karen Petersen, Development Director of Tongaat Hulett Developments, which has made the land available for the project. 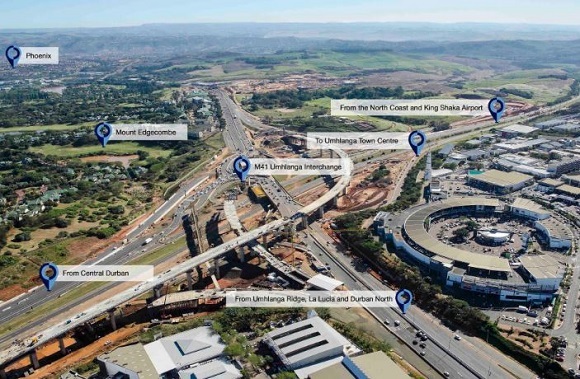 “The shopping centre is one of the key amenities that will be provided to the 1,200 hectare mixed-use development which stretches from Umhlanga towards the King Shaka Airport. Construction began in March 2016 and, with six cranes in action, has already moved to the second level. Fitness enthusiasts will not be disappointed with a Virgin Active Gym signed up, while a Cycle Lab mega-store and trampoline park BOUNCE are also lined up. Other tenants which have been secured for the mall are Nu Metro, Outdoor Warehouse, Dis-Chem, Clicks and Bakos Brothers. The mall design incorporates the convenience of a retail park combined with the sophistication of a mall with differentiated retail experiences, each unique in their architectural language and style and interconnected by landscaped walkways, bridges and sidewalks. In addition, the road network is integrated as part of the development so that shoppers can park and shop with ease. The importance of Cornubia can be summed up in the words of Human Settlements Minister Lindiwe Sisulu when visiting Durban in 2015: "This project is very close to my heart, it demonstrates what we as a nation can achieve when we partner with business and investors."